Just recently Biers has been rather busy in Dean Lane, and this is the first of two pieces I am posting. Biers likes this particular wall and has sprayed here before. I think I got here just a little late, as it has a rather incongruous line “cocaine is good for your brain” scrawled across the piece. In this wall I think he has included alongside the letters BIERS the cartoon character Willo the Wisp, the voice of which was expertly provided by the late Kenneth Williams. 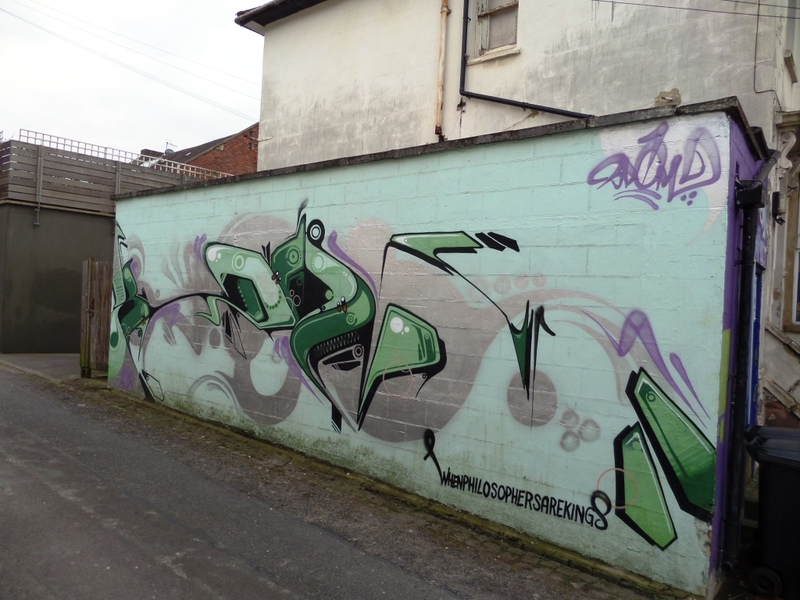 A nice tidy piece on one of my favourite walls in Dean Lane. My absolute favourite piece of the year so far. This is an outstanding collaboration between two of the Bristol ASK masters, Sepr and 3Dom. As well as the composition, which is brilliant, the location is also cleverly chosen. This wall was home to a 3Dom piece of writing that had remained here for a long time, completely untouched. I do hope that this piece is offered the same level of respect. On the left is a snorkeler in blue, with gold trunks and a starfish on his head expertly sprayed by Sepr. If this isn’t weird enough, 3Dom has painted the most incredible jelly fish in rich and vibrant tones wearing a WW2 sea mine on its bell and with a chain trailing behind in its tentacles. A thing of quirkiness and real beauty. The whole thing comes together magnificently, the contrasting colour palettes of each artist marking their work but combining in the centre of the piece. So sharp and fresh, this is a really high quality piece. being in quite a narrow lane, it is quite difficult to capture in a phiotograph, but it is a real beauty. Sophie Long is an established artist in Bristol whose wildlife pieces with stunning drips are well known to those who look out for such things. I recently posted her fabulous shark piece in Cheltenham road which I walk past pretty much every day. This upright orangutan is rather beautiful and conveys so well the sombre disposition of these incredible creatures. we are reminded of our evolutionary closeness to them and our utter disregard for their environment. Orangutans have become an emblem of despair, but also of hope for the future. This fine piece would sit comfortably on any naturalists wall.